Built around a 17th century farmhouse, Dormy House is a lesson in fine design. It's only when you step inside that you begin to understand what the Dormy is really about. Contemporary design meets Cotswold chic. It's a relaxing place where you’re encouraged to put your feet up. After all, isn’t that what furniture is really for? House Spa has a serious mission and a light-hearted touch. (Signs remind you to "Switch off your mobile phone and come to your senses.") A team of highly–trained staff is dedicated to the complex demands of the modern leisure guest. Indulgent treatments are designed to bring noticeable health benefits; and you will be able to swim and gym to your heart's content. The Main House – Twelve traditionally styled guestrooms with a warm and homely feel. These rooms have their own VIP lounge. Some feature hand–painted wallpaper, natural fabrics and linens and all have large en–suite bathrooms. Emily Wing – These five guestrooms have been given a1950s retro–vibe and a hint of Danish influence. The influence is in reference to the owning family's Danish heritage and Dormy House's sister property: Ruths Hotel in Skagen, Denmark. Lavender Lodge – A separate wing is being created with its own entrance. Bold geometric patterns and contrasting colours create a glamorous New England feel in each of the five guestrooms, which include the beautiful Lavender Loft at the top. This suite has its own balcony with views towards Broadway Tower. Room 4 has a four–poster bed and a balcony with views over the Vale of Evesham. Danish Court – Each of these 10 elegant, individually–designed guestrooms has its own patio/garden area. 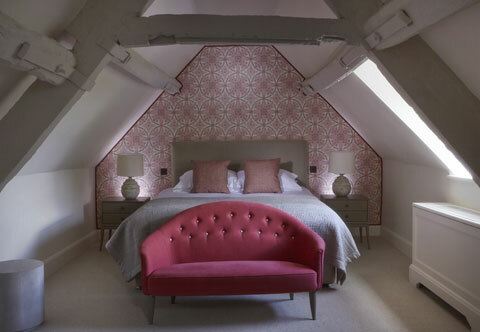 Penthouse Suite – On the second floor of the hotel, accessed by its own private staircase, the Penthouse has sweeping Cotswold views. This is a stunning, expansive space with a beautiful en–suite and a double shower. The Rose Cottage – An intimate haven with its own sitting room, bedroom and private garden. The design is quintessentially English and its floral décor is inspired by the hotel's gardens.